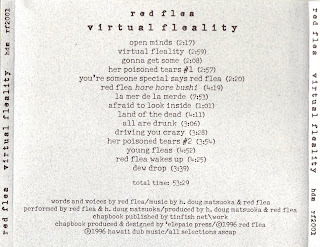 Recorded, mixed, mastered, and produced over a long period of successive alternate Saturdays in 1995 and 1996, "virtual fleality" was released in 1996. 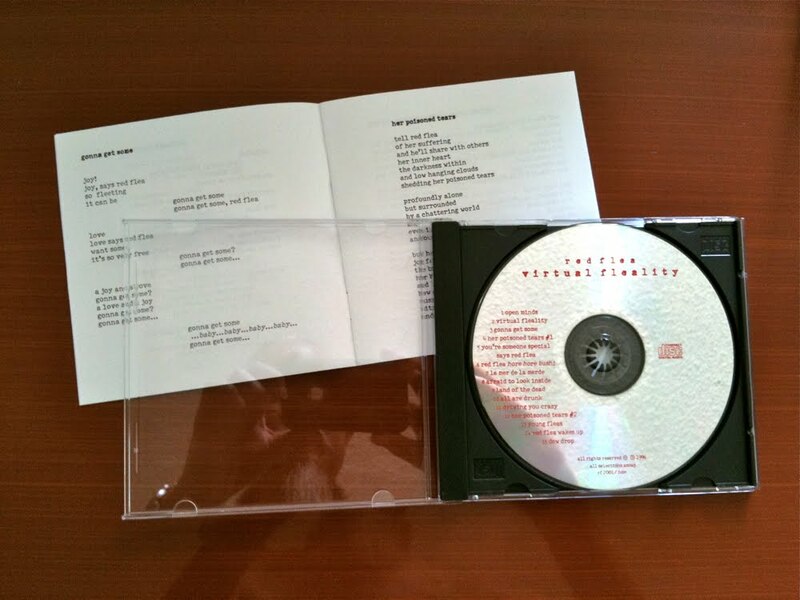 The original (and only) run of 300 CDs, each with a handmade 28 page chapbook, is long gone. 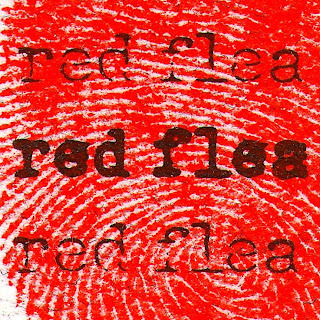 It is hereby officially reissued in digital form for distribution to the literary and musical denizens of this new era. 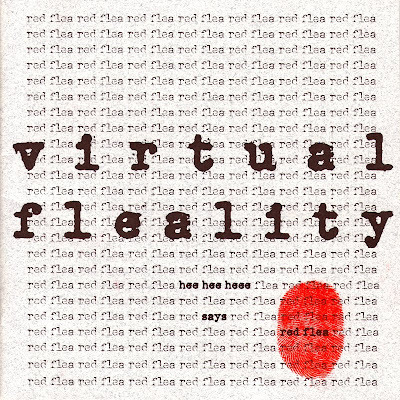 Virtual fleality is available at the iTunes Store, Amazon, etc. What is virtual fleality? 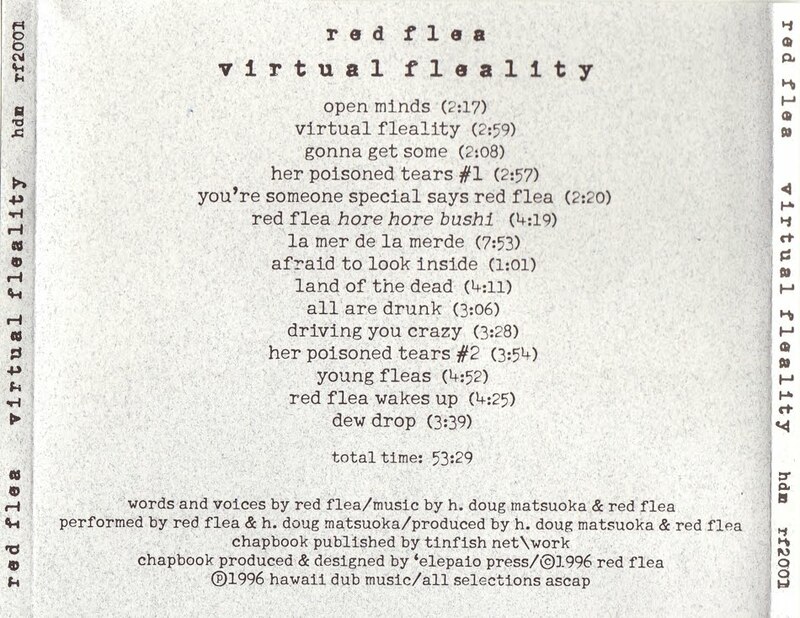 Virtual fleality is "amplified poetry," a form coined by red flea and improvised upon by us. You will note that amplified poetry is not a category on iTunes. If it were, this would most likely be the only entry. 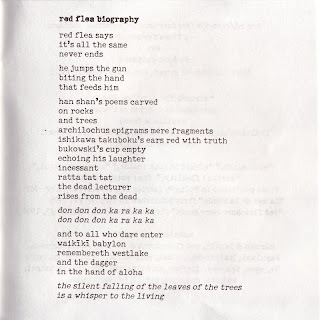 The recitation of poetry over music is a traditional convention, but amplified poetry uses acoustic and amplified musical instruments, electronic recording and manipulation to create something different. 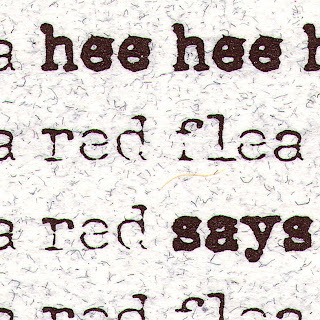 The voice sometimes loops back over itself to create a canonic polyphony of voice, a voice wave created by mixing in different takes, and subjecting everything to a gentle digital audio massage. 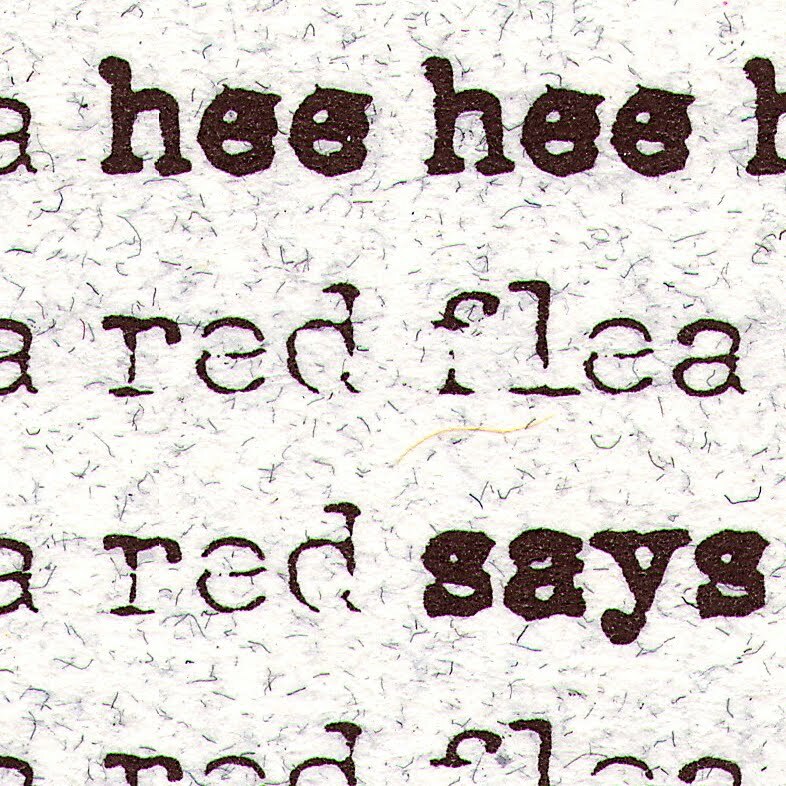 All recording was done within the womb-like perpetual protection of The Midnight Mental Hospital in Niu Valley, Honolulu, using an early version of an 8-track digital audio recorder. 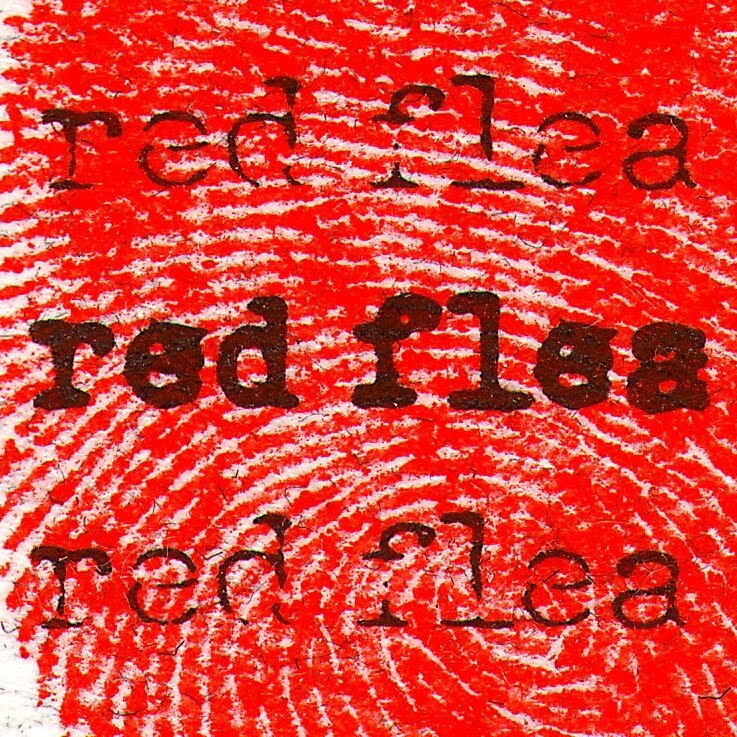 The analog mixes were done in real time by red flea and myself. Several "four hand mixes" of each selection were recorded to two track master, and the best one was selected later. The chapbook was designed to fit within the CD jewel box (link to wiki entry for CD jewel box) and was designed and produed by ‘elepaio press and published by tinfish net\work. 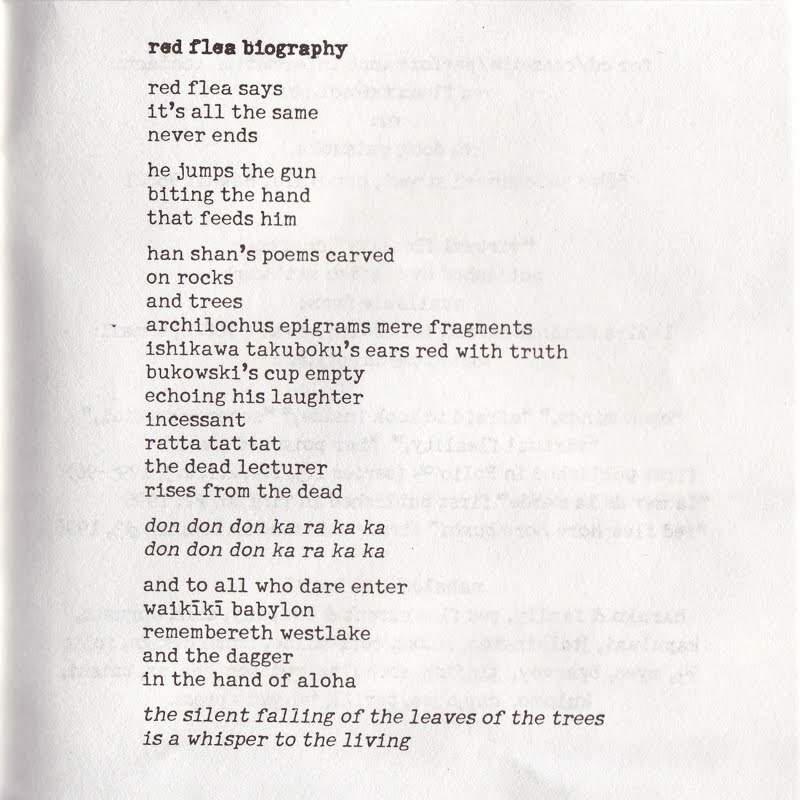 Each chapbook was red-stamped by redflea himself and each chapbook was paired with a CD. The question is, of course, why reissue such a historic work of literary esoterica? Many among us seem other worldly. Your hangover lasts two days. You're itching all over.